Now here's a fun first for the #WomensHistoryReads Q&Q&Q&A series -- our first newly announced Guggenheim Fellowship recipient! 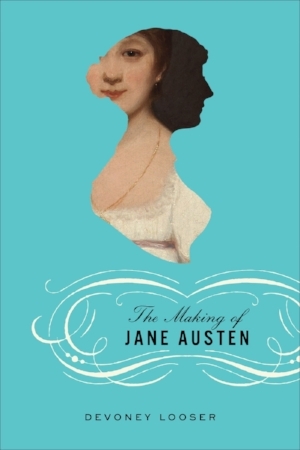 I couldn't be more thrilled to publish this interview with Devoney Looser, author of THE MAKING OF JANE AUSTEN. She's also the first #WomensHistoryReads participant, as far as I know, with a roller derby alter ego (which is, of course, "Stone Cold Jane Austen.") Devoney's passion for her subject and her overall enthusiasm are infectious. Get in on the fun below! Devoney: Jane Austen inspires me on a daily basis. Like a lot of Janeites, I discovered Austen’s novels in my teens. In my case, it was my mother who started it. She kept nudging me toward these books. I was resistant, honestly, at first. Austen’s language seemed so impenetrable and stiff. It was maybe the third time that I started Pride and Prejudice that it just clicked somehow, and I was hooked. It became a favorite book. It was only many years later that I learned that my mother had never read it herself. She just knew that Austen was an author you were supposed to read, and she wanted me to get an education. I love that Austen has been be handed-down that way, too—by aspirational word-of-mouth. My mother’s persistence worked on me, because I became the first in my family to graduate from college, with an English major. I went on to get my PhD in English directly after that, so I’ve now had several decades to teach British women’s writings, including Austen, to college students. I even ended up meeting my husband over a conversation about Austen. (He’s also an Austen scholar and a professor.) But it was one of my graduate students and a special collections librarian who got me into roller derby. My librarian friend was the one who suggested my derby name, Stone Cold Jane Austen. (I knew who Steve Austin was, because my brother had been a WWE fan growing up.) The nickname “Stone Cold” stuck, and I absolutely love the sport and inhabiting an Austen-inspired alter ego. I played roller derby competitively for five years, and I’m now the faculty adviser to Arizona State University’s roller derby team, the Derby Devils. You never know where Jane Austen is going to take you, right? It’s wild to think that Austen has shaped nearly every part of my adult life—career, marriage, and hobby. That led to my becoming one of the Jane Austen weirdos profiled in Deborah Yaffe’s Among the Janeites (2013), and it led to a research interest in unsung Jane Austen weirdos in decades and centuries past that I wrote about in my book, The Making of Jane Austen (2017). Devoney: I can quote way too many lines by heart from the movie This is Spinal Tap (1984)—probably about as many as I can quote from Jane Austen novels, embarrassingly. I grew up in Minnesota in the hair-metal era, and so that mock-rockumentary (if you will!) just cracks me up to no end. I also really identify with the world described in Chuck Klosterman’s great book Fargo Rock City. . . . As if that weren’t enough, I absolutely love that there is a Jane Austen and Spinal Tap connection. One of the producers on This is Spinal Tap, Lindsay Doran, went on to produce Ang Lee’s Sense and Sensibility (1995). I think this makes *perfect sense,* by the way, especially if you read Jane Austen’s Juvenilia or teenage writings. Devoney: And two questions for you. What drew/draws you to the nineteenth century? Why do you think this is an important period for those of us who are interested in strong women? Greer: My first historical novel landed me in the late nineteenth century kind of by accident -- the 1880s up through 1900 just happened to be the most plausible period for a female stage magician to make headlines in Vaudeville, which was my inspiration for The Magician's Lie -- but ever since then, I've stayed there on purpose. There are certainly stories of strong woman across the ages, but there's something about that nineteenth-century period, at least the parts of it I'm drawn to, where women are really breaking out of some "ideal woman" trope, and they're not just doing it during wartime, which is traditionally the period that really opens doors for women stepping into male roles. For example, it's not all that shocking to hear that women were spies during the Civil War -- because of course people would do anything for their cause, and of course some of those people were women. But is it more surprising to know that the first woman detective, Kate Warne, was hired by Allan Pinkerton in 1856, well before the war started? It was to me. The courage she must have had to step into that role, to demand a place at the table, is really inspiring. And I've written mostly American history so far. The nineteenth century is a great period in America in particular -- this long rolling wave of expansion, connection, discovery, redefining community. I tend to write about people who are redefining themselves. It was a perfect time to do that in America.